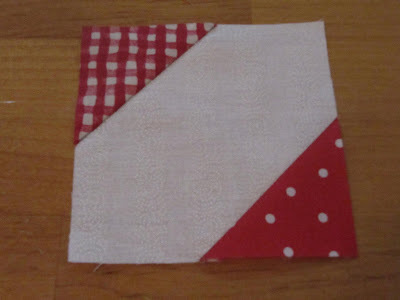 This is the post for everyone who would like to make 2 blocks for Jodi from Pleasant Home. I mentioned it in this post. I was trying to think of a color combo for her and the first thing that came to mind was RED. She loves her red. 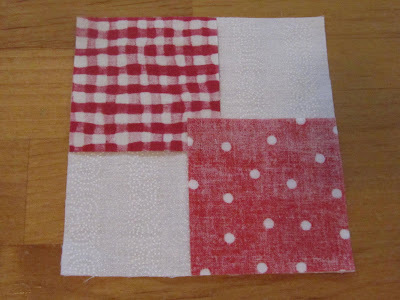 Your squares can be made with any reds you have in your stash. Here is the block 4-1/2 inches unfinished. Close-up of the finished size. The signature block starts with a 4-1/2 inch square of white fabric. 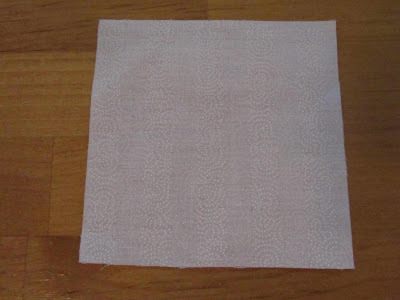 You can use any white that you have...whether it be a plain white muslin or a tone on tone white where there is a little white pattern in the design. 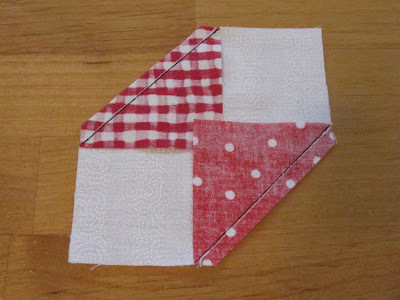 You will also need 2 more red squares cut at 2-1/2 inches. These can be 2 different reds or more of the same red that you used in the 4 patch. If you have a lot of reds in your stash, it will make it more scrappy! 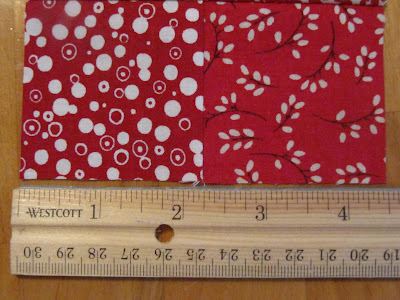 Place one 2-1/2 inch square in the upper left corner and one in the lower right corner. Draw a pencil line as shown below. I used black ink so you can see it just for the tutorial. Stitch following the pencil line. Trim to 1/4 inch from seam. Now you can write your name, where you are from or a message to Jodi. What ever you'd like. It's great to use a fabric pen, but a fine point marker or pen works too. Just set the ink with an iron when you are done. If you need to stabilize the fabric to write on, just iron on a piece of freezer paper to the back side. 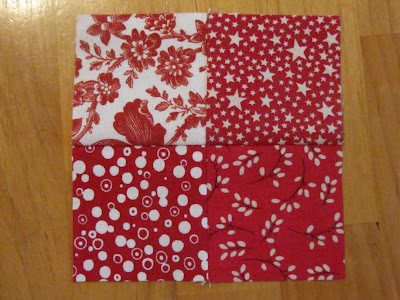 and here they are...an easy siggie block and 4 patch. This is a quilt top that I made with Thimbleberries a long time ago. I didn't have a pattern, I just made it up as I went along. I sold it on ebay...now that I see this picture again, I want to make another one. 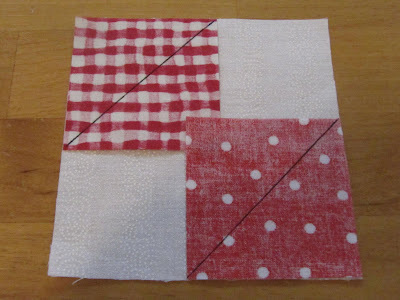 This is the pattern I was thinking of using with all our squares!!! Thanks again for doing this for Jodi. She is going to go nuts for the red and white quilt. 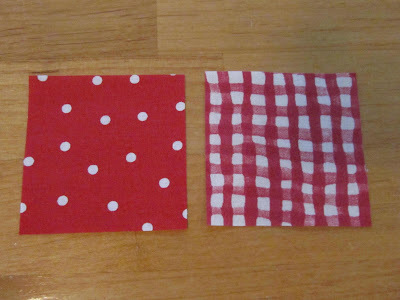 One little extra tid bit...she loves cherries, so if you have any red cherry fabric!!! I'm sending a group email with the mailing info. Any questions just email me. Okay...I'll get on that tomorrow, Karen. You have made it easy enough that I'm sure everyone will get it done nicely AND quickly! All right,Karen. 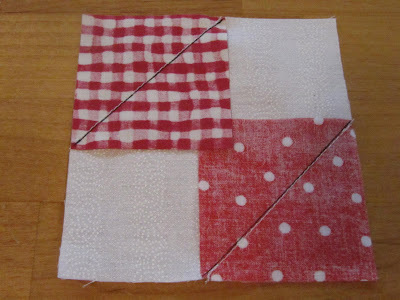 This 'how to make' is so nice and this quilt will be great! Yes, Cherry,Red, White are Jodi's favorit. Great! I have lots of red in my stash that would be perfect for this project. I will get right on this because (as Pat, above, knows) mail is sloooow from Canada. Am I to late? I would love to make the blocks for Jodi. Please let me know, thanks. Hopefully, it will be on its way tomorrow!! Thanks for doing this, very thoughtful of you! Okay! Thank you, it'll be weekend before I can do this. I like your quilt idea, how neat! This should be a very quick and easy project to complete. 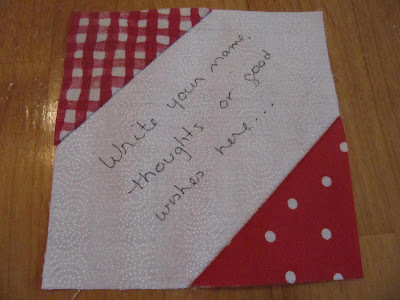 Very sweet gesture to coordinate a quilt for your blogging friend in need of a hug. I always like your photo tutorials, very clever signature block construction! 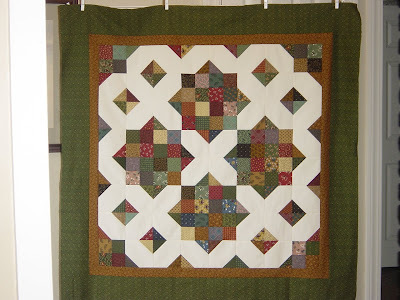 The e-bay quilt is stunning, and making it up gave you an original! I'm not surprised you had a buyer for that one. 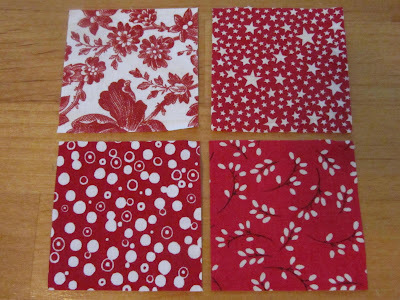 I've recently used Thimbleberries fabrics for the first time, they are lovely! Jodi is going to go crazy over this quilt. It will be a nice pick-me-up for her. I like that quilt A LOT! So cute and easy. Heading to my red stash! I will make them ASAP. I was thinking about the signature blocks too! Great idea and i sure she will enjoy it! Quick question: I have a cherry fabric but it's on a yellow background, do you wanna keep it only red quilt? You're so kind in doing this for her. And your finished quilt you sold on Ebay is wonderful! I just love it. I'll be sure and email you when the two blocks on their way. 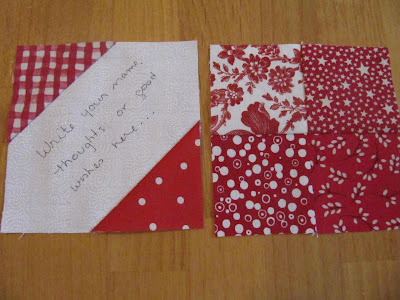 This is going to be a fabulous quilt, what a wonderful idea you've had! I don't know Jodi, but I am glad to take part in this project. I will make the blocks this weekend and drop them in the mail Monday morning. Do you still have room for those who didn't find the blog until after the sign-ups to make squares? Or do you have enough? I love your blog. I'm new to Blog Land and am having a ball with all the inspiration you gals have to offer! This is going to be great! I will start on it this week. I've changed my profile to allow you to see my e-mail address. However, if you still can't it's myraung@yahoo.com. I've picked out my reds and white, cut the blocks and marked the siggie block. I should be able to get them done tonight, so look forward to your address appearing! The blocks are ready to send. BTW, I have found some really wonderful Blogs from the links on your site. Your's is still the first one I visit, however. It's a favorite. Really like all that you do. Karen: I did this block last summer at the cottage in black print and it turned out fabulous. Amazing that one can get a few different looks from this block.